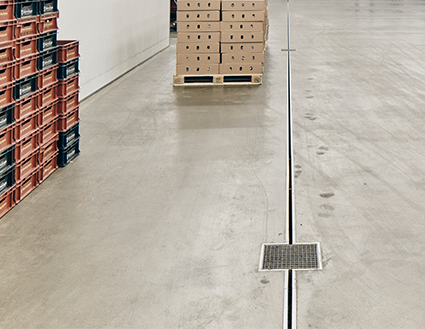 Our commersial programme includes floor channels and floor gullies in stainless steel of highest quality. We keep in stock a standard assortment of commersial channels in various widths and lengths. As well as our popular Channel 100, we also offer other stainless steel channels for commercial and industrial settings, which can meet specific requirements. The Channel 200 and Channel 300 are available in standard lengths up to 2.5m, and our Industrial, Laundry and Kitchen Channels are all also available in a wide range of dimensions. All stainless steel channels are suitable for a range of floor types and we offer customised channels and floor drains, ranging from minor customisation of our standard product range to more complex solutions. All channels are manufactured in our factory in Smålandsstenar. Purus channel 100 is an economical product designed to minimize the cost while raising construction, hygiene and design. It is a narrow channel with high capacity and the gully is also available in plastic, which also makes Purus channel 100 unique. It is suitable for installation in most environments: heavy-duty industry with channels equipped with high-load mesh gratings, in kitchens, hospitals, laboratories where hygiene is important, but also in environments where interior design is important. Build your own Purus channel 100 in our configurator. See estimated delivery time and technical specifications. One push to send the price request. We offer a wide selection of standard components for your specific needs for e.g. fixed lengths, all floor types, different outlets, selection of outlet location and much more. The advantage of a channel system rather than a regular channel drain or gully is that it can lead away water from a large area, and there are built-in fall units in the channel. 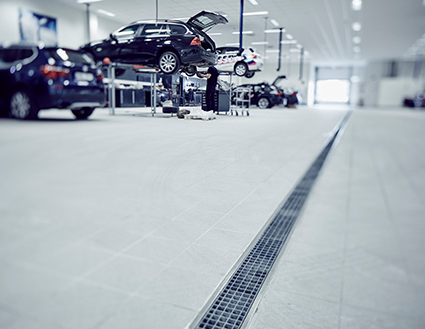 Our channel systems - Slot drain and Grate drain - are based on channel drains, gullies, water traps and grates and are both for concrete flooring or tiled flooring without waterproofing membrane. The design makes the installation both simple and secure. In addition, you only need to install one channel drain instead of several gullies in the same area. Both can be combined with T and L-shaped angles, which allow the system to be expanded in two different directions, a total of 24 metres at most (12 metres in each direction). The large gully, together with the buffer created by the channels, creates a system that is well-suited for handling large amounts of water. See our different channel systems here.